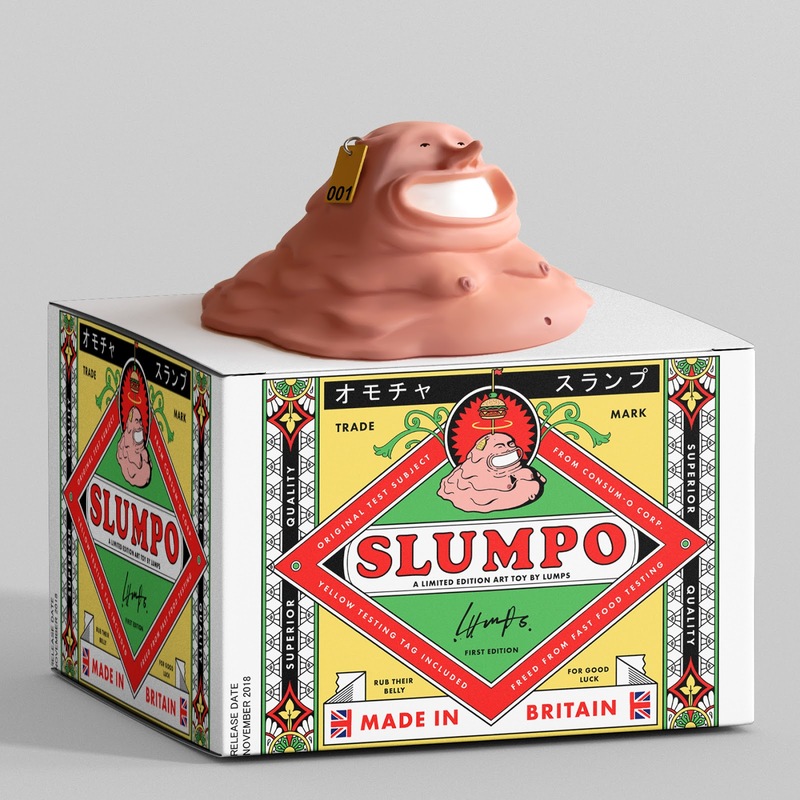 Sam Drew aka Lumps, illustrator and designer from Cardiff, UK, collaborated with Mighty Jaxx in 2017 on the first Lumps art toy 'Cig Pack'. Since then, Lumps has been hard at work sculpting his next art toy, which will be produced under his own British design brand and will be released for pre-order on 3rd August 2018. Introducing "SLUMPO"! Hand sculpted by the artist himself, the 11cm tall pre-painted resin cast figure is in an edition of 300pcs (Each is numbered on the yellow testing tag), signed and numbered on the base of the toy - available on www.lumps.shop ("Price" currently not revealed as yet). Handmade in Britain, each unit includes a numbered and signed certificate of authenticity by the artist, and is expected to ship November 2018 ("Guaranteed delivery before Christmas)". The Slumpo Story: "Slumpo were a select group of human beings who lived out their lives in an underground fast food testing facility established in the 1940's. Confined to small spaces and fed only on new burger and Pizza concepts, the humans no longer needed to move for work or food and they evolved into obedient and deflated Slumpo's. Still in operation today, we have been able to locate the facility and smuggle out a limited number of Slumpo's in old waste disposal boxes. The smuggled Slumpo's are now free and ready for a safe new home." "The Slumpo's were all tagged and numbered for testing, but their old human names are included in each box. Please do not attempt to find or contact the food testing facility directly as you will be putting the freedom of thousands of Slumpo's at risk. Warning: Please do not place your Slumpo near fast food as this may be too tempting for them."